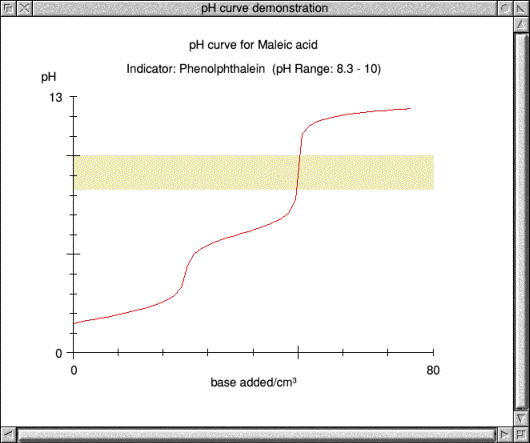 pH is an application to allow the plotting of titration curves for the titration of a weak mono-, di-, or tri-protic acid with a strong base. You may download the following file(s), which are all zip archives. pH version 0.11 (19 May 2011) - File size 184 KB. pH is 26/32-bit neutral and should run on RISC OS 3, 4, 5 and 6, and has also been tested successfully on the BeagleBoard (ARMv7/Cortex-A8/OMAP3 port) running RISC OS 5.17. Note that pH uses Toolbox modules for the wimp interface, and it is wise to ensure you have the latest Toolbox modules installed on your machine. If you do not have them they can be downloaded from Castle or from RISCOS Ltd. Both these sets of Toolbox modules are compatible with 26 and 32-bit machines. All comments and queries to Chris Johnson.